Just south of Nishi-Ogikubo station on the JR Chuo line is a quaint kominka, traditional Japanese home, with a restaurant and retail shop. Re:gendo offers nutritious meals in a rustic setting that is worth a trip out of the city. A good friend put this shop on my radar and she even knew to pre-order the vegetarian sushi when she made the reservation. The set made with seasonal vegetables is only made in limited numbers and if you don’t reserve it in advance there is a good chance you can’t have it. The shop is popular so it is best to make reservations. The menu is rich in vegetables, but not exclusively vegetarian. 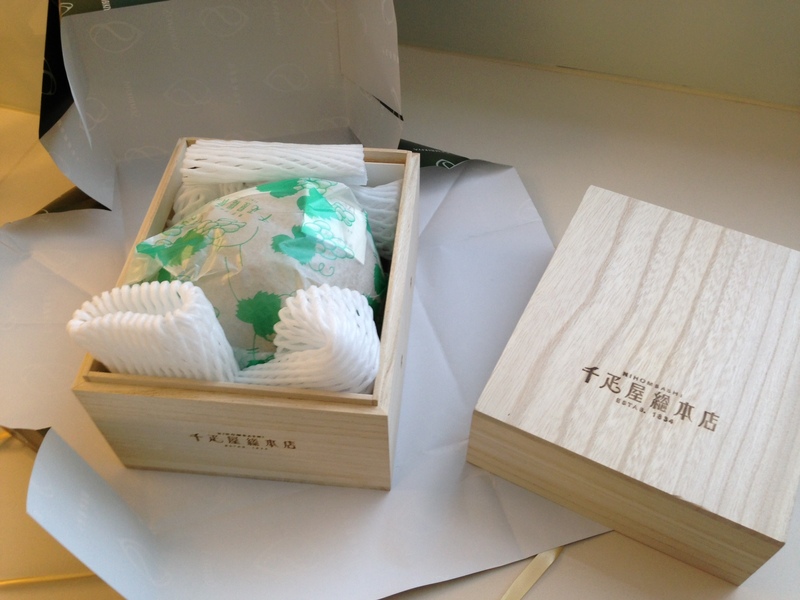 The photo on the left is the menu, which folds out of a what looks like a Japanese wallet. The sushi included two made with fruit, mango and strawberries, along with pickled vegetables, tempura, a savory custard, and a hearty miso soup. The retail shop features tableware, kitchenware, and ingredients. Many of the items sold here are handcrafted. If you like some of the dishes used for your meal you may find it sold in the shop. The Nishi-Ogikubo area is fun to walk around and carefully peruse, so plan on spending an afternoon here. After each meal I leave nourished and inspired to eat better and to surround myself with beautiful things. One of my favorite lunch spots in Tokyo is at the New York Grill in the Park Hyatt Tokyo. The view at 52 floors above Tokyo is amazing, even when it is overcast and lightly raining. 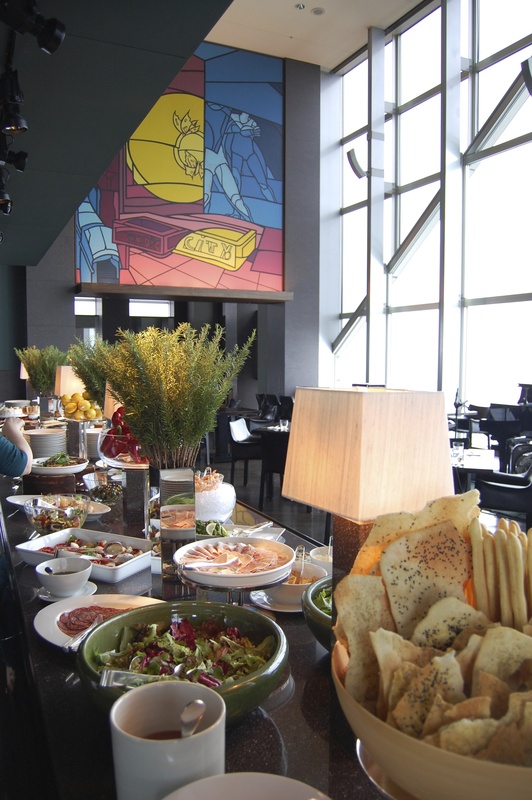 The lunch starts at 5,000 JPY and includes a gorgeous buffet of appetizers. 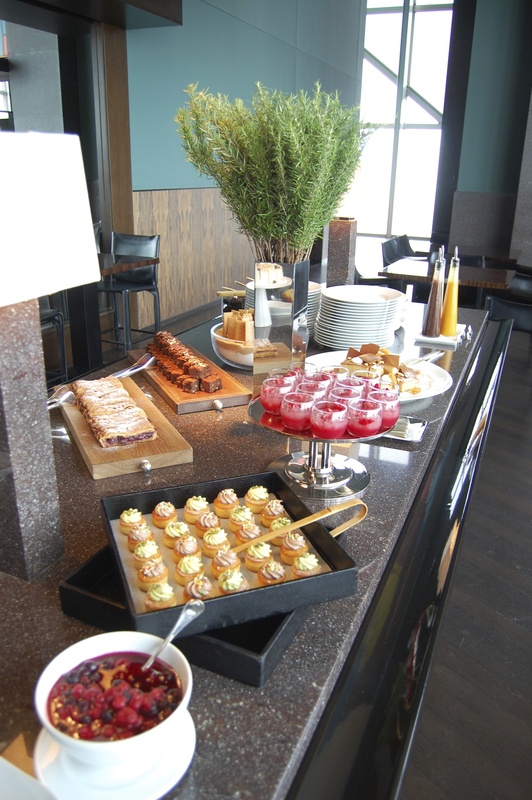 Customers choose a main course and then dive into the buffet again for dessert. Appetizers include flatbreads, salads, sliced meats, and much more. It’s hard not to stuff yourself with only appetizers, but make sure to make room for the main course. We asked for seats at the kitchen counter so that we could talk with chef Federico Heinzmann. He was very gracious to talk to us about the different dishes and answer our many questions. Sitting here is also fun as we can watch all of the customers come in. It’s such an amazing spot that it is great to watch the faces of guests as they look into the open kitchen, as they check out the view, and as they walk into the main dining room. On this day it was cloudy and I expected the restaurant to be quiet, but even on this day it was busy. Argentinian chef Federico recommended the chicken as it “is the most Latin”. 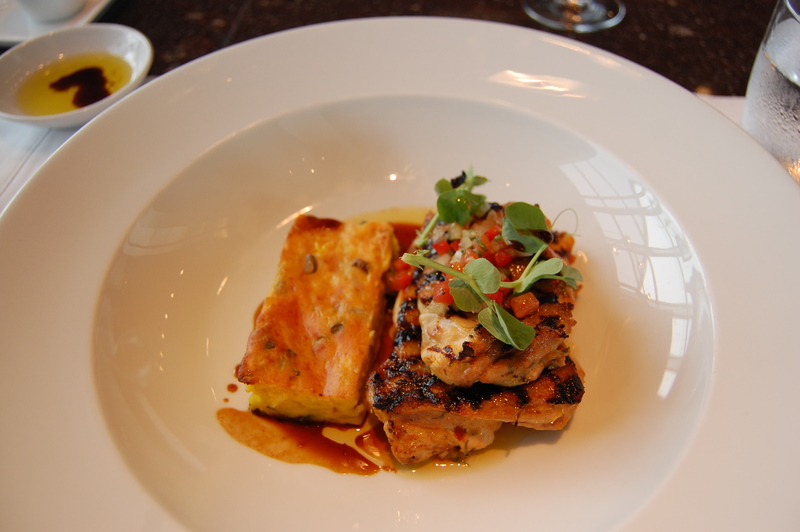 The chicken is marinated in orange juice, grilled and topped with a fresh salsa and served with a corn cake. Living in Tokyo the flavors are so exotic and I quickly said that I would not be sharing this with Shinji. Shinji was fine not sharing as he loved the lamb, which we don’t eat very often. The sauce was made with bell peppers and hazelnuts. Chef told us about how in Spain this is used as a dipping sauce for whole leeks that have been charred and peeled. it sounds like an amazing dish. The hazelnuts makes it a very meat, albeit, vegetarian sauce. Chef Federico was kind enough to share the recipes for the sauces for both dishes, so we will try to recreate some of these at home. The wine list is rich in American wines, mainly from California. There are always interesting offerings by the glass, perfect for lunch. This is only half of the dessert buffet. There is something here for everyone, including ice cream and several sauces and toppings as well as a simple fruit salad with mango and pineapple, and key lime pie. Coffee and dessert is usually taken in the New York Bar so diners get another magnificent view of the city. Fans of Sofia Coppola’s Lost in Translation will remember this space as it has a starring role in the movie. Service is always impeccable here. If you are looking for a special lunch spot, the New York Grill, never disappoints. I have come in the past with girlfriends and we still reminisce about our lunch here, years later. 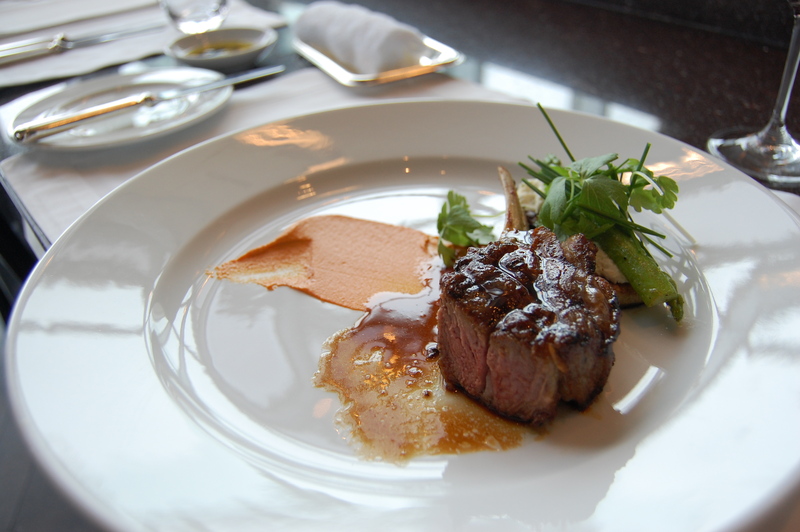 The view, the cuisine, and the service makes this a memorable meal. Pickles play an essential role on the Japanese Table. It is served at many meals. At a kaiseki meal it is included in the rice course with miso soup. Casual curry shops serve fukujin-zuke, a soy-based relish made with daikon, eggplant, and cucumbers. If you really love Japanese pickles, then be sure to have a meal at Kintame. There are two restaurants in Tokyo, my favorite is in Monzennakacho, but the branch at Tokyo Station’s Daimaru department store is centrally located. We try to include pickles when we can. It’s an easy way to get an extra vegetable dish on the table and fermented foods are good for you. 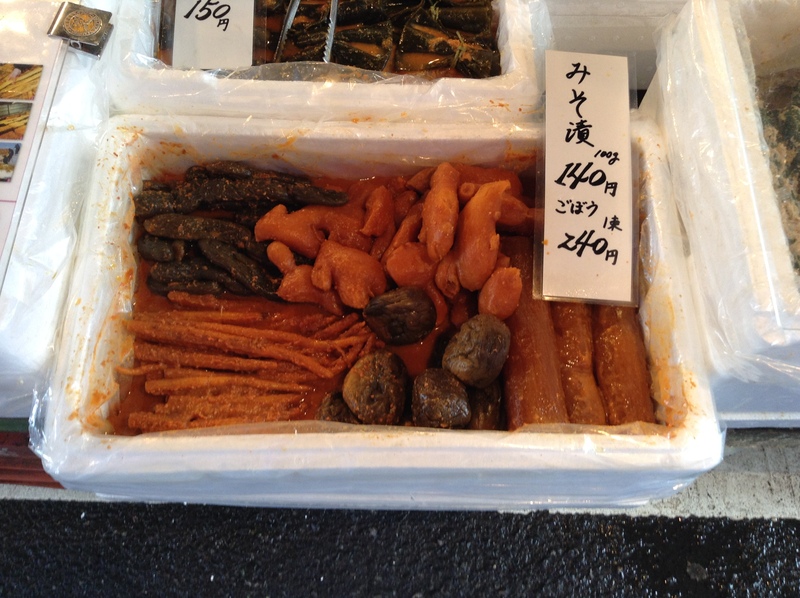 In the photo above are three pickles from Nakagawaya at Tsukiji Market. On the left is the pickle that I am currently crazy for. Thin slices of ginger and garlic pickled in soy sauce. It has a kick and is great with white rice, fried rice, or simply over tofu. 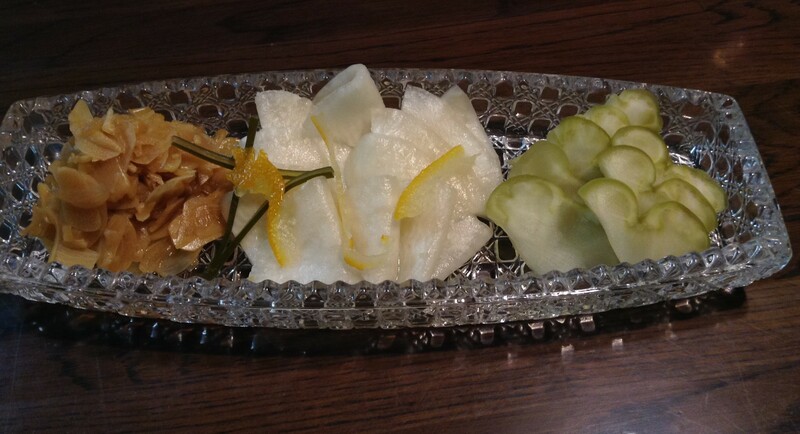 In the middle is an aromatic yuzu and soft kabu turnips. 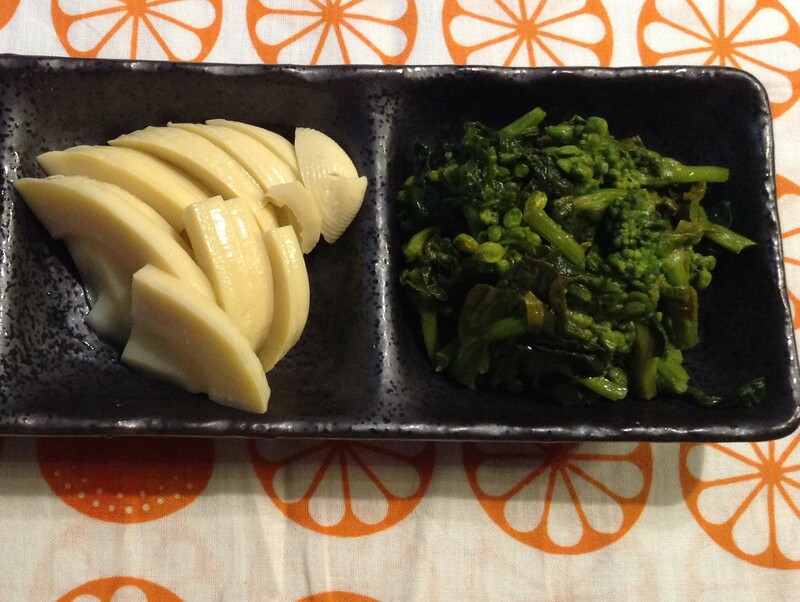 On the right is pickled zassai (Brassica juncea), a Sichuan vegetable called zha cai, which has a nice texture and unique flavor profile that is not usually found in Japanese cuisine. 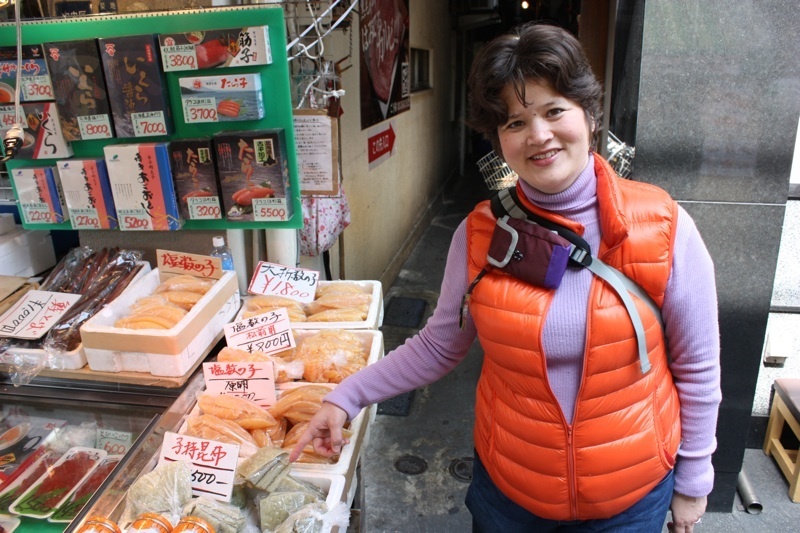 There are many shops at Tsukiji Market selling pickles, but none have the selection and variety that Nakagawaya has. The shop is located in the outer market and is easy to find. Some of the pickles are vacuum-packed so it is easy to pack in your luggage to bring home. The staff here are very friendly and the selection is changing throughout the year. 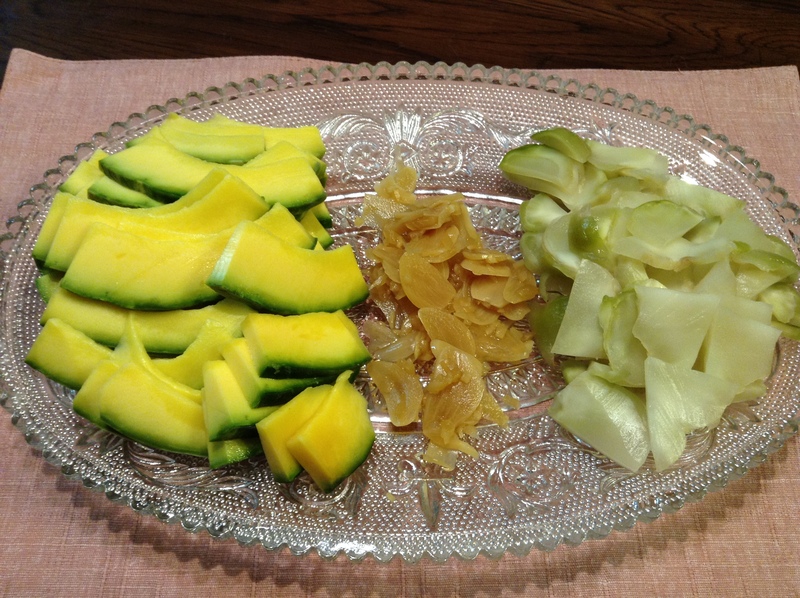 There are many regional pickles brought in from all over Japan like iburigakko, the smoked daikon pickle from Akita. This spring we had bamboo shoots and nanohana (field mustard). The bamboo shoots were very tender and pickled in a light-colored soy sauce. The nanohana had a bit of a spicy bite to it. We have tried making kabocha squash pickles at home to no success. The kabocha here has a soft crunch to it and adds a beautiful color to any table. Eggplants are in season now and these are harvested young, perfect for pickling. 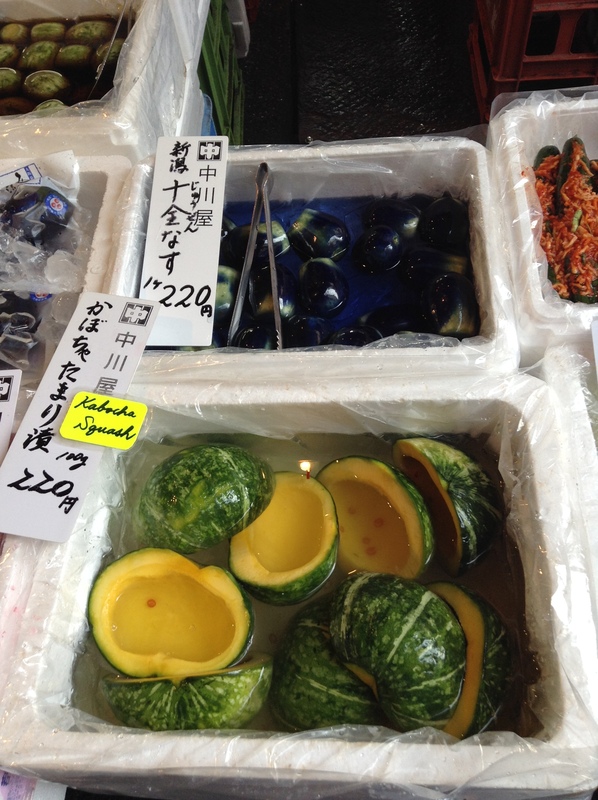 The kabocha pickles are sold like this. Nukazuke (rice bran pickles) are something we make at home. Here you can see in the box cucumbers, carrots, and turnips. The rice bran is washed off before cutting and serving the pickles. Here are the misozuke (miso pickles) of cucumbers, ginger, daikon, eggplant, and gobo (burdock root). A very unique pickle that is fun to try are these made from nagaimo and yamaimo potatoes. The pickles have a very crunchy texture but once you start chewing they become very slimy. These come in flavors of shiso, wasabi, and tamari soy sauce. In the bottom pickle can you see that kombu (kelp) is wrapped around the pickles and tied with kampyō (gourd)? Wasabi-zuke is a pickle made from wasabi and saké lees, on the bottom, the two pickles one the left (975 JPY and 760 JPY). Next to that is saké kasu (saké lees) and kōji. Both of these are great fun to cook with at home. We use the saké lees for marinating fish before grilling. The kōji is a very popular cooking ingredient for making shio kōji and soy sauce kōji that can be used as a pickling agent, marinade for proteins, and as a seasoning for stir-fries, salad dressings, and soup. Working at the sake section of the depachika in Nihonbashi Takashimaya was loads of fun. As a sommelier it was my job to sell wine but my responsibilities also included selling sake, shochu, and other spirits. Who wouldn’t love to be surrounded by amazing food all day long? My breaks were spent carefully perusing the floor for new items. I would plot all morning what to have for lunch that day. The food was constantly changing and Takashimaya often held special food events on the top floor of the department store. Here I would learn about regional food, sake and shochu, and meet the purveyors who enthusiastically shared cooking suggestions and what makes their products unique. Here are my favorite depachika in the city. It is best to pick a location based on what is convenient for you. Most of the depachika are similar. However, if I have to pick some favorites they would be Nihonbashi Takashimaya, Shinjuku Takashimaya, Shinjuku Isetan, Ginza Mitsukoshi, and Ikebukuro Tobu. Inquire at the concierge if there are any special food events going on in the store as they may be held on an upper floor and not in the basement. The restaurant floor here is great – several floors of tempting restaurants. I love Katsukura for tonkatsu. Better yet, pick up a bento and a beer in the depachika and head to the rooftop picnic area. Next door to Takashimaya is a huge Tokyu Hands for great shopping for kitchenware, tableware, stationary, and much, much more. There is a branch of Taiwan’s Din Tai Fun in the basement 2 and the sake department often does weekly tastings of small sake and shochu producers from around Japan. The rooftop garden is a great place to have a bento. Also, do not miss the white-gloved elevator girls (rarely seen now) and the historic elevators. Aged sake (koshu) in a special cellar and a manicured rooftop garden for enjoying your bento. Pierre Herme and Jean-Paul Hevin are popular with the locals but I love the wagashi (Japanese confectionaries). A recent renovation has made this a depachika you don’t want to miss. The restaurant floor includes a branch of the famous Hakone Akatsukian soba shop, formerly in Hiroo. Time it right and watch as the soba noodles are rolled out into thin sheets and cut with the large soba bocho (soba knife). Japan’s largest depachika. Spend hours here and still not see it all. Also, several restaurants on the restaurant floors including a branch of Chinese iron chef, Chin Kenichi. The French bakery Maison Kayser is here. Located just under the Shibuya station I love the affordable sushi at Uoriki, a sushi counter located near the fresh seafood section. The sake department here also does interesting tastings of small sake and shochu brands. Divided up between two buildings it may be tricky to see all of it but worth checking out. The breads at the Trois Gros bakery are tempting. There is also a Bic Camera for electronics located above the Odakyu annex. A branch of the French bakery Paul is here and the store often does interesting food shows on the upper floor with themes such as ekiben (famous bento boxes from local train stations around Japan) and regional food promotions. In the Seibu department store is a branch of Loft, a shop filled with housewares. OK, 11 best depachika in Tokyo! So where do Tokyoites do their grocery shopping? There are large supermarkets, like Ito Yokado, Daiei, or Seiyu (a subsidiary of Walmart) but these require a lot of space so are usually found a bit out of the city. There is an Ito Yokado a few stops from Tokyo station on the Tozai line at Kiba, definitely worth visiting if you are curious about a large Japanese supermarket. 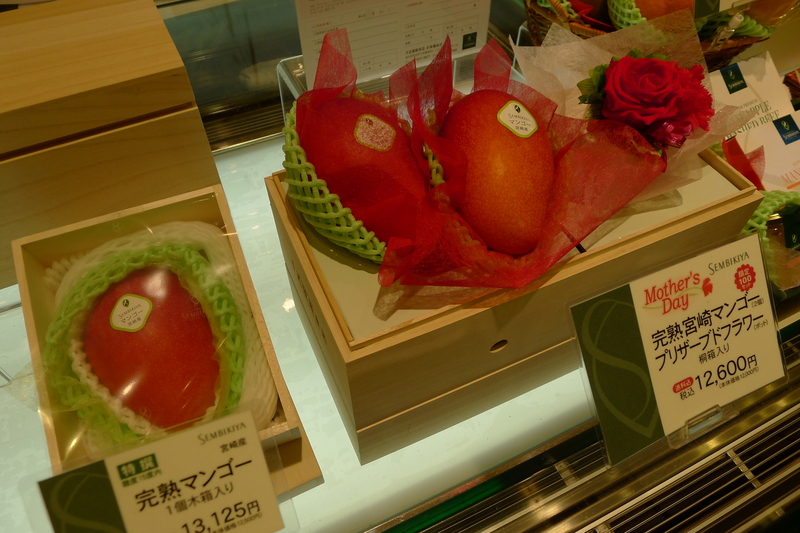 In the city there are smaller supermarket chains like Akafudado, Inageya or Queens Isetan. As well, there are discount supermarkets, my particular favorite is called OK. It is like a regular supermarket, just cheaper. These three types of supermarkets are good for one-stop shopping. I go to these shops when I am limited on time. I round out my shopping at 100 (or 99) yen shops like Daiso or Lawson 100. Here I pick up sundries like dried shiso (yukari) and kitchen or tableware. These shops are everywhere (we live on top of one) so I usually end up going in at least once a day for one thing or another. Something to drink, an onigiri between meals, or some chips, these shops have a wide variety of products. If time permits, I prefer shopping at shotengai, or shopping arcades. 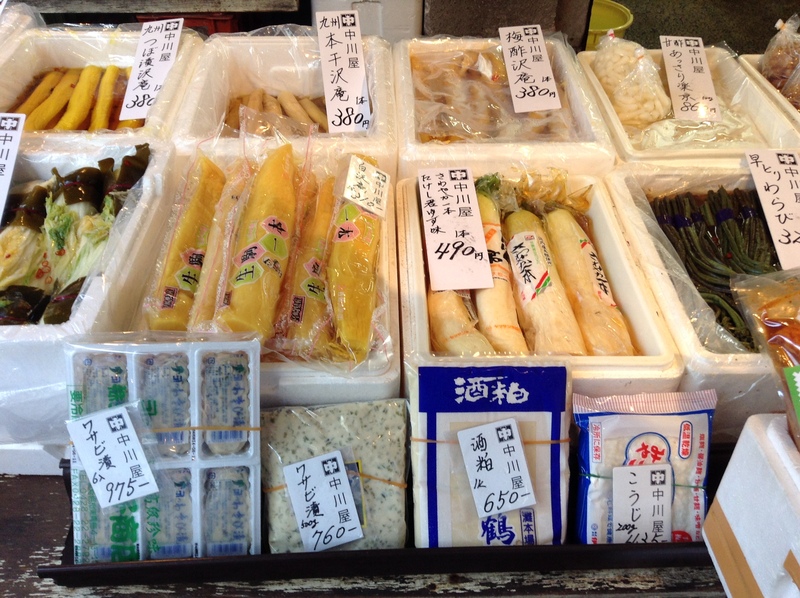 Small specialty shops for items like tofu, rice, seafood, produce, or tea. Here you’ll find freshly made tofu or you can have the fishmonger help you select seasonal seafood and have him filet it for you. I wrote a piece on shotengai for Metropolis magazine. When I lived in Monzennakacho, very close to the city center I did most of my shopping at Ito Yokado and Akafudado. Not only a supermarket Ito Yokado sells almost anything else you would need for your home, similar to a Super Target in the USA. Akafudado is a smaller supermarket, but the shop in Monzennakacho also sold other items for home, etc. on the upper floors. On Saturday mornings I would take my scooter a few minutes to Tsukiji Market and shop in the outer market. 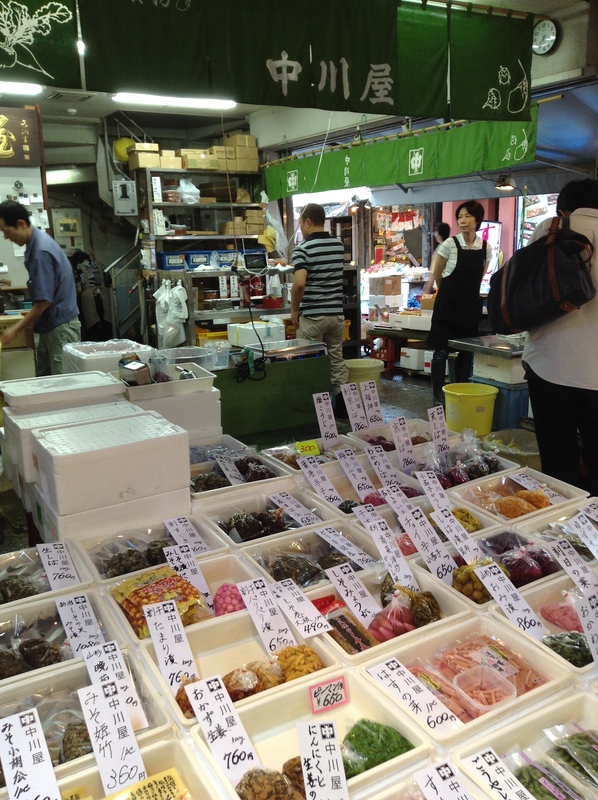 Tsukiji is ideal if looking for good quality kombu, katsuobushi, pickles, tea, and much more. If I am hosting a dinner party, Yamaya is good for getting wine and Hanamasa is great for discounted meat and vegetables. For nihonshu and shochu there are several options including depachika or specialty shops like Hasegawa Saketen for nihonshu or Shochu Authority for shochu. 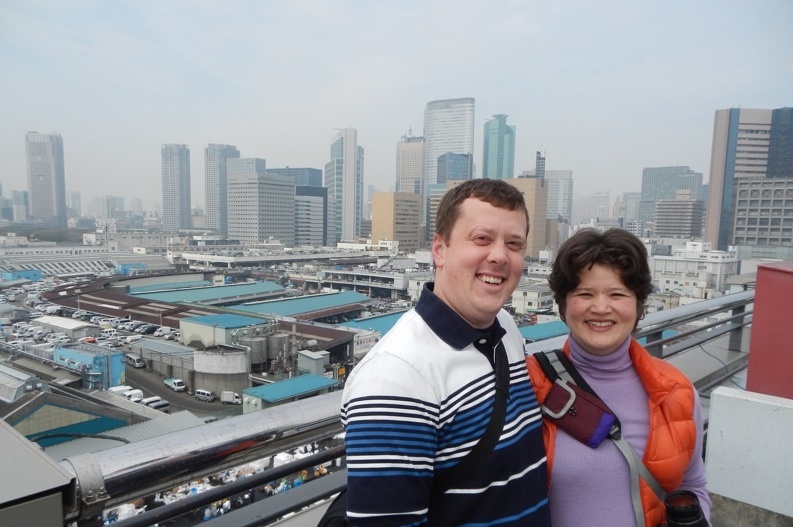 Our home near Kokubunji, in the Western suburbs of Tokyo, is close to a great discount supermarket called OK. Most of our shopping is done here because it is minutes from our home and the prices just can’t be beat. Shinji buys a lot of our seafood at Uoriki as he used to be a buyer for them. 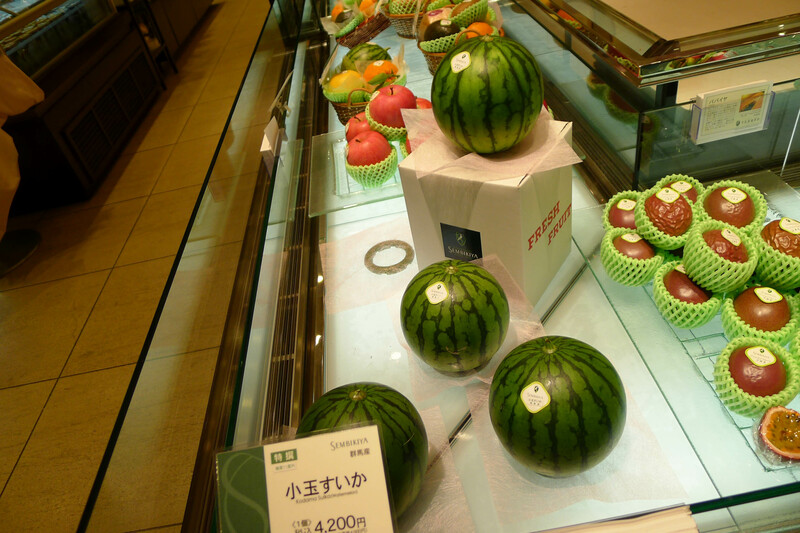 I also love to shop at depachika, especially for prepared foods. I don’t like to fry at home so if I wanted to have some tempura with soba noodles I would pick up the tempura at depachika. Top quality seafood, meat, and produce are also available at depachika. While it can be expensive, some items will go on sale later in the day so if time permits, I like to poke my head into depachika before dinner. My favorite depachika are Isetan and Takashimaya. There are many small chain supermarkets that vary from neighborhood to neighborhood. Names to look out for include Peacock, Tobu, or Tokyu. There are too many to list. 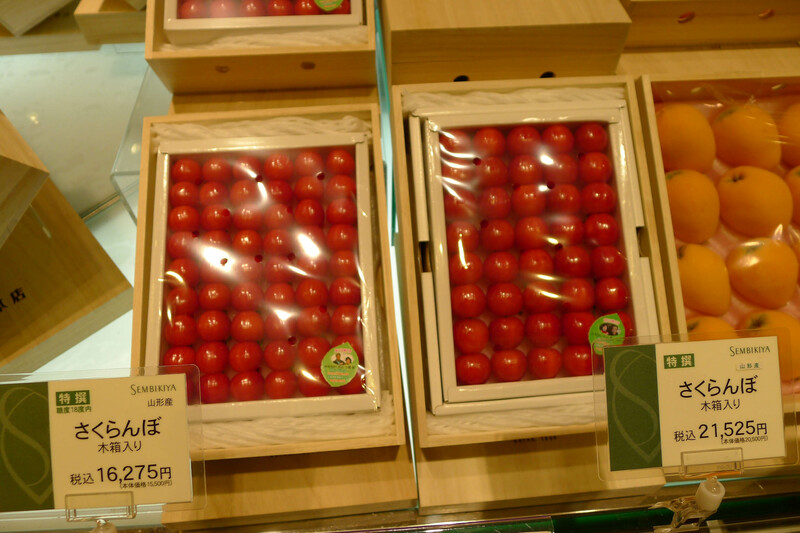 Here is a list of supermarkets in Tokyo. When I get a craving for Western products I usually go to Nissin (pronounced nishin) or Meidi-ya (pronounced meijiya). If you are visiting Tokyo and would like to visit a large supermarket I suggest Ito Yokado near Kiba station on the Tozai line. Koto-ku, Kiba 1-5-30. Here is a list of popular shotengai (shopping arcades) in Tokyo. Here is my list of “gotta gets” at the supermarkets. 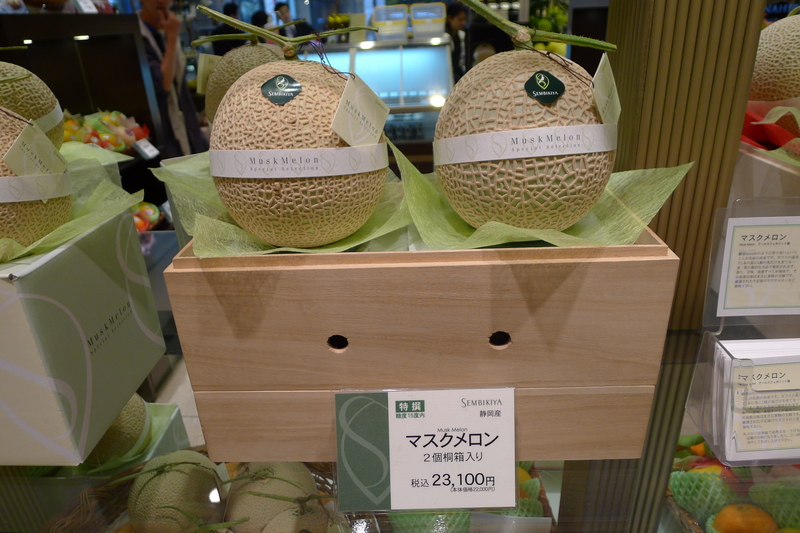 Here is Steve Trautlein’s article on International Supermarkets in Tokyo. 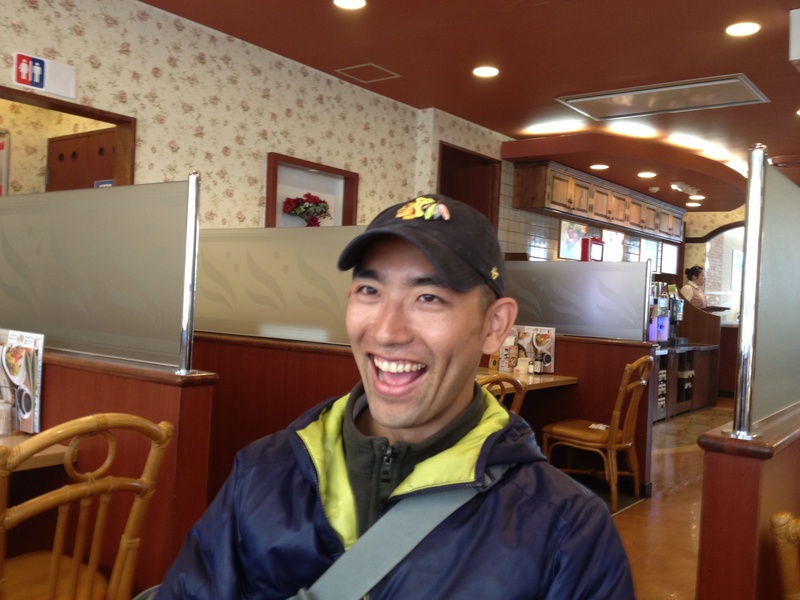 If you are living in Tokyo and would like a supermarket tour, please contact us. Supermarket tours are usually held in your local supermarket. It helps you to demystify main ingredients for cooking at home. Our contact information is here. 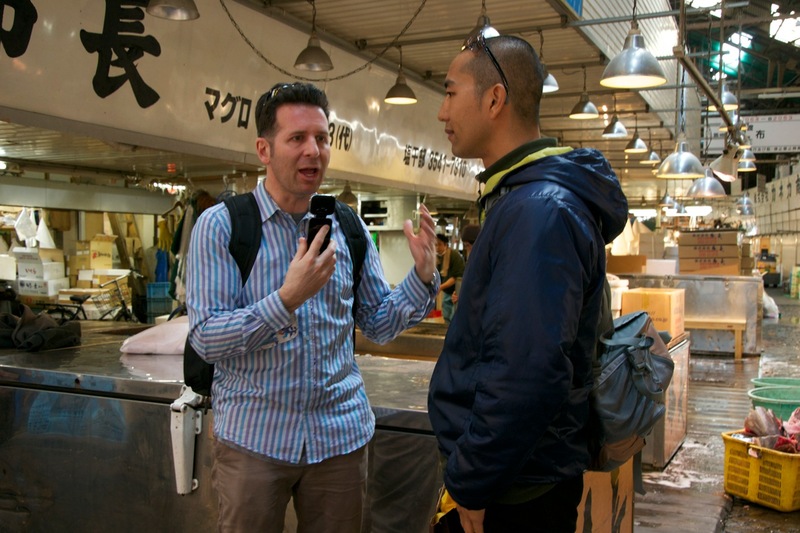 This interview appeared a while back but I wanted to share it for its information on some of my top recommendations for foodies visiting Tokyo. Born in Japan and raised in the United States, Yukari Pratt Sakamoto, the author of the soon-to-be-released Food Sake Tokyo (Little Bookroom, $29.95), is a true Tokyo food insider. Here, she shares her favorite restaurants, bars and gourmet shops in the Japanese capital. What are some Tokyo restaurants you would recommend for the following types of meals? A traditional Japanese dining experience: Tofuya Ukai, one of the most unique dining experiences in the city. It specializes in tofu and soy products, but also serves seafood and meat. The menu is kaiseki style with several courses. For an authentic local experience, I would recommend Yamariki. And if you’re looking for a high-end dining experience with a big-name chef, there’s Nihonbashi Yukari with Iron Chef 2002 winner, Kimio Nonaga. What are some restaurants you would suggest for families traveling with kids and why? Tofuya Ukai is nice, as each group gets their own private dining room. Ivan Ramen is a child-friendly ramen shop run by a native of Long Island, Ivan Orkin. And also try going to a kaitenzushi shop, the sushi shops with a conveyor belt. These are made for families. A popular shop is Magurobito (Roppongi; 81-3-3405-5466) that does a very nice job with good seafood. Ask for any “shun” or seasonal seafood that may be off the menu. Another very good option for children are restaurant floors located in department stores. Here you will find a variety of restaurants (sushi, tempura, tonkatsu, etc.) and these shops are accustomed to families. What are the types of food not to miss trying while in Tokyo? Seafood-based food like sushi, tempura, and unagi (eel). Noodles like soba and ramen. And of course, kaiseki (Nihonbashi Yukari is one of my favorites). 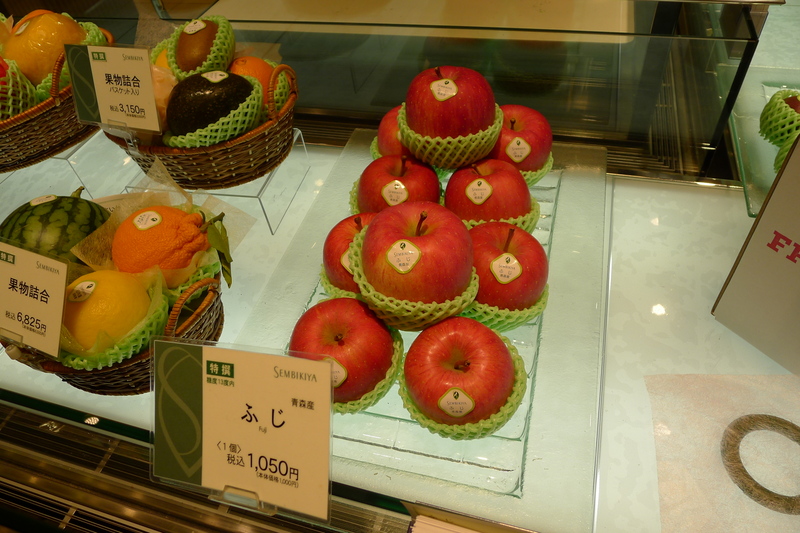 Also, the wagashi(traditional Japanese confectionaries) should be experienced. Good stores for wagashiinclude Toraya or Kano Shojuan. Hormone ryori (innards) are very popular at the moment. Try Saiseisakaba or Yamariki. 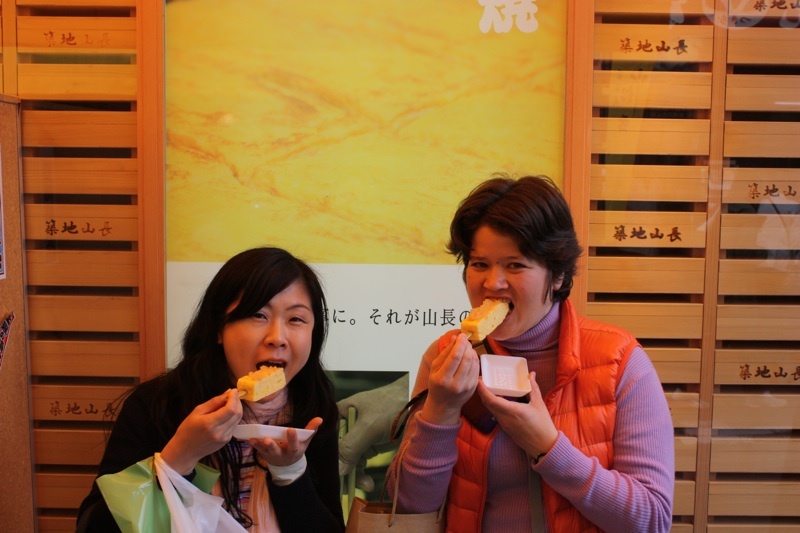 An ideal eating trip to Tokyo would be to visit different shops that specialize in one type of food. Birdland (Ginza; 81-3-6269-9825; http://ginza-birdland.sakura.ne.jp/ for yakitori, Kondo (Ginza; 83-3-5568-0923) for tempura,Kyubey (Ginza; 81-3-3571-6523; www.kyubey.jp) for sushi, Tamai (Nihonbashi; 81-3-3272-3227) for anago (eel), sukiyaki (hot pot), soba, ramen, etc. What are some tips to navigate the incredible food floors in the department stores in Tokyo, and which ones would you recommend for a first-time visitor? There is usually a concierge on the first floor by the main entrance of each department store. Inquire if there is any special food events taking place, these are often on an event floor. Often there are maps of the food floors, these are good as some are so big you can get lost. 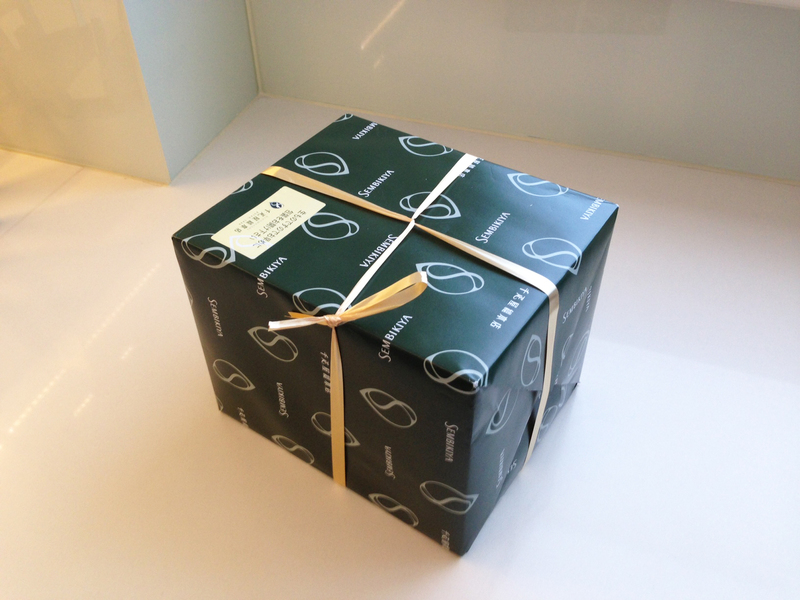 The best one to visit is Isetan (Shinjuku; 81-3-3352-0909;http://www.isetan.co.jp) in Shinjuku. What are some of your favorite Tokyo bars (both classics and new ones)? 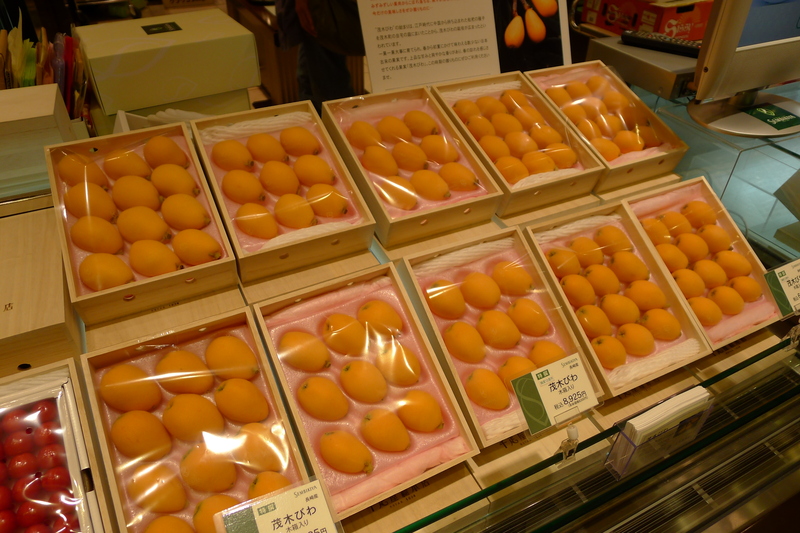 What are the main culinary items visitors should buy in Tokyo? Knives at Kiya (Chuo-Ku; 81-3-3241-0110; www.kiya-himono.co.jp) in Nihonbashi. Lacquer at Kuroeya (Chuo-Ku; 81-3-3272-0948; www.kuroeya.com) in Nihonbashi. If a traveler only has one day and night in Tokyo, which are the places you would suggest to get a good taste of the city (lunch, dinner, drinks)? Have lunch at Kyubey Sushi in Ginza; dinner at Nihonbashi Yukari, and finish your night with drinks at the Park Hyatt’s New York Bar & Grill in Shinjuku. What are some of your favorite spots in the city that are not food-related? Asakusa, Meiji Jingu Shrine, Monzennakacho. A very short trip out of the city, but still a part of Tokyo is Mount Takao. Some of my favorite shops at Tsukiji Market. This article first appeared in Metropolis magazine. 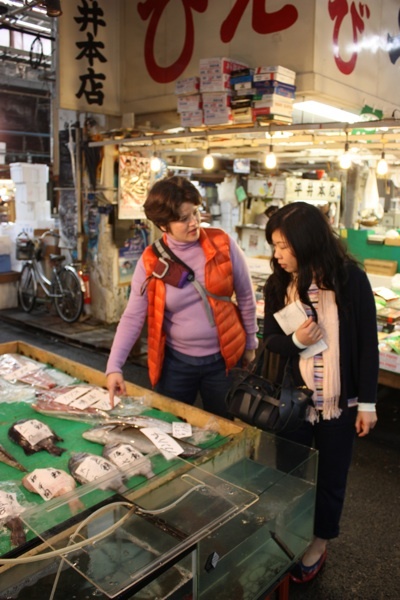 It is no surprise that the bustling, frenetic Tsukiji Market is a popular tourist destination. Nowhere else in the world will you see so many varieties of seafood under one roof. Restaurants such as Sushi Dai and Daiwa Sushi have lines out the door before the sun comes up with customers hungry for fish as fresh as it comes. 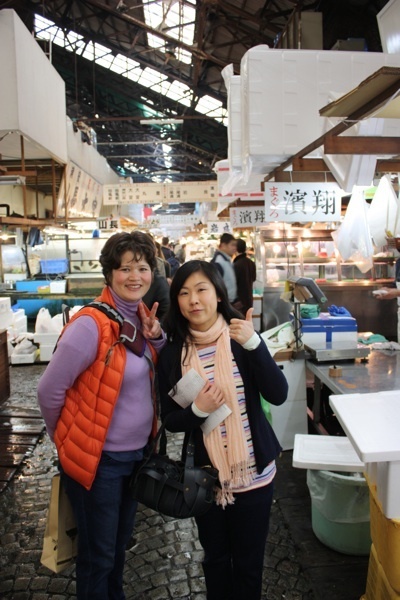 The Tsukiji places that I am most familiar with, however, are the many shops in the outer market. These are open to the public, and you can get your hands on the same goods that are stocked in many of the top restaurants in town. 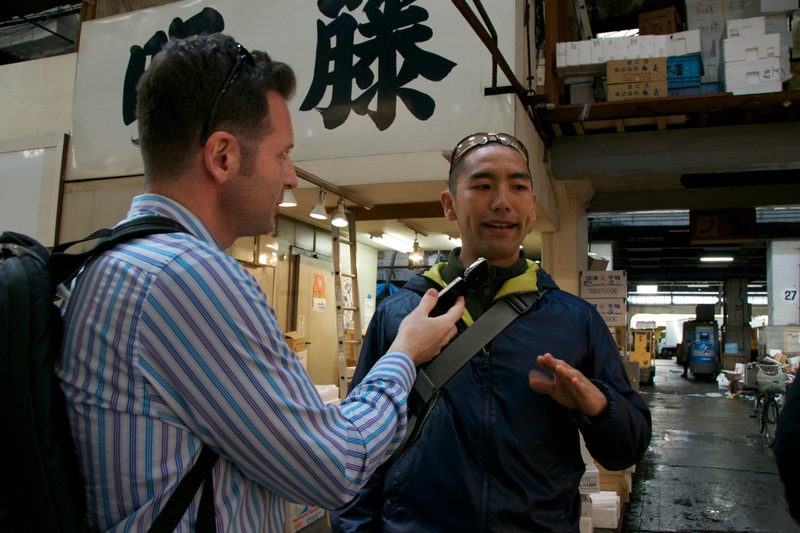 Keep in mind that shopping at Tsukiji is not as easy as at, say, depachika. 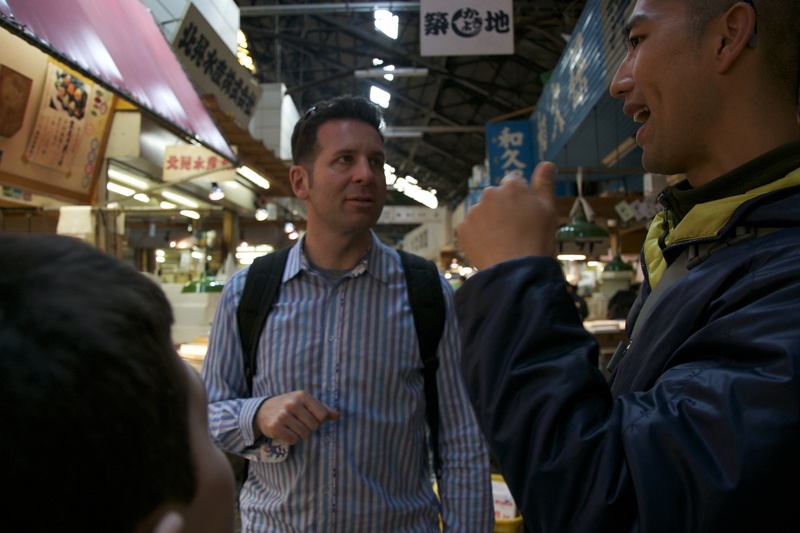 Navigating the narrow aisles of Tsukiji, you must watch where you step and be mindful of the speeding stevedores. But your energies and efforts will be rewarded. Here are some of my favorite shops; I am sure you will discover your own. If you are allergic to cooking, or are too busy to bother, you can pick up ready-to-go meals. 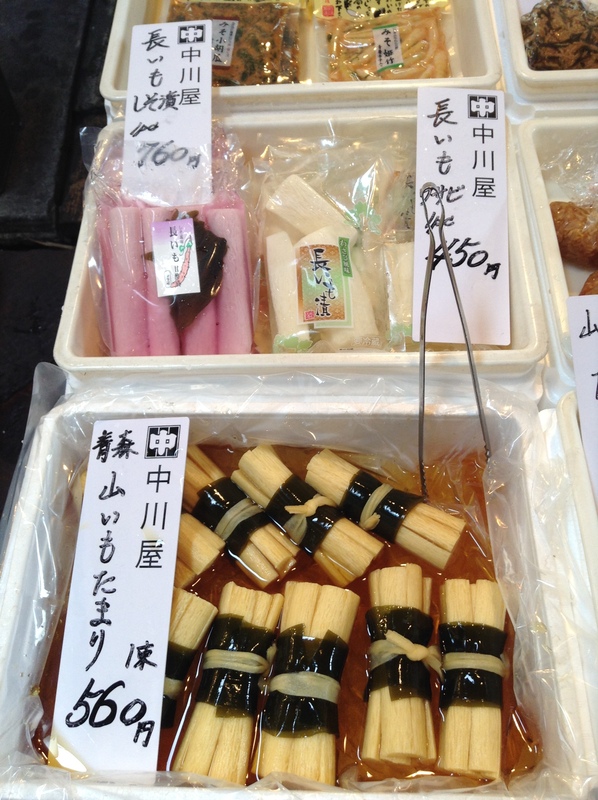 For fans of oden, Tsukugon puts the convenience-store varieties to shame. Served up with some nihonshu, these bites of fish deep-fried and stuffed with goodies like shrimp or gobo (burdock) are irresistible. An oden feast wouldn’t be complete without some tender, slow-simmered daikon, deep-fried ganmodoki tofu, and light, airy hanpen fish cakes, which look like marshmallows. Fans of dim sum can indulge in the homemade yummies at Yamucha Suga Shoten. The food here is much better than anything you can get at your local supermarket, and it saves you a trip to Chinatown in Yokohama. Chill some beers, pack your steamer with gyoza, shumai and nikuman, and you are ready to chow. For home cooks, there are plenty of shops to satisfy any urge. In the mood for something hot and spicy? 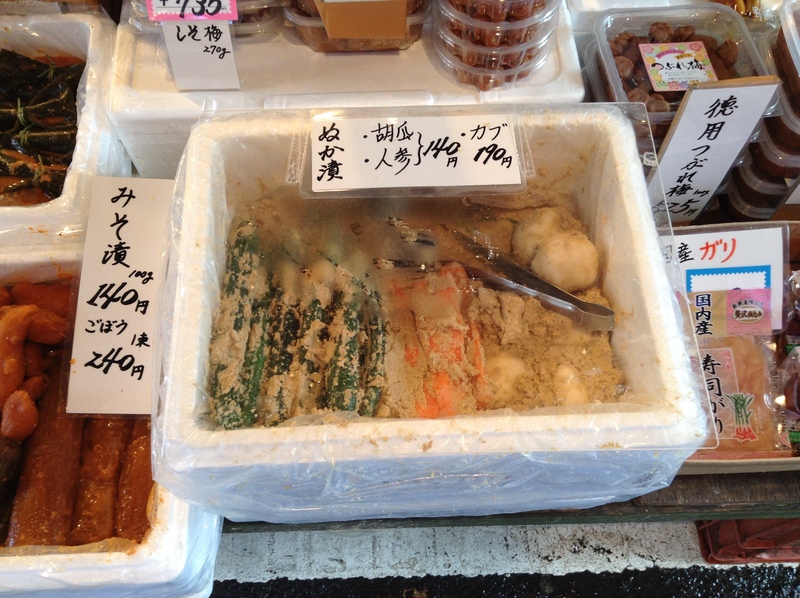 Check out the varieties of kimchi, including negi, sesame leaf and octopus, at Marukita. Fill up your basket with Korean seaweed, sweet miso for barbecues or marinades, and some creamy, sweet makkoli—low in alcohol and an interesting alternative to Japanese nigorizake. Incorporate the kimchi into fried rice, serve it up in a nabe with some tofu and thinly sliced pork, or simply eat it as a beer snack with some of that addictive Korean seaweed flavored with sesame oil and a generous sprinkle of salt. The variety of vegetables available in Japan is one of the delights of cooking at home. 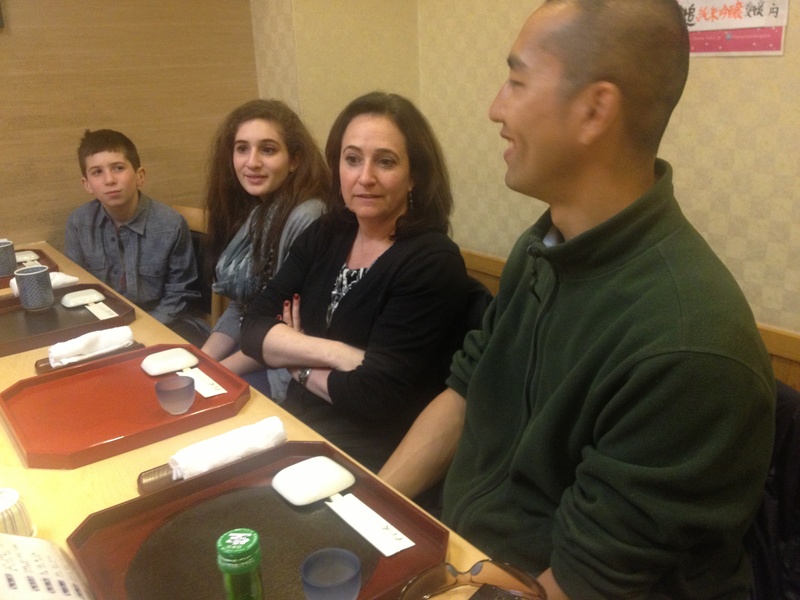 At Vegetable Ishibashi, you will discover produce you can’t find at your neighborhood supa. Check out the kyo-yasai—vegetables native to Kyoto, such as mizuna salad greens. Kyo-imo potatoes simmered until tender are dense and rich, and the sweet, burnt-orange kyo-ninjin carrots will add color to any dish. a couple hundred at any time of the year—colorful vegetables pickled in salt, vinegar, miso and more. From the ubiquitous umeboshi apricots found in every bento box to the heady narazuke, which is pickled for years and is an acquired taste, you’ll find something here to make you pucker. The venerable knife shop Aritsugu, from Kyoto’s Nishiki Market, dates back 400 years. At its sister shop in Tsukiji, you can invest in everything from knives to graters to strainers. The cutlery, if cared for properly, will last a lifetime, and would make a great gift for any cook. Tsukiji is centrally located in the heart of the city, just a short walk from Ginza or Tsukiji stations. It’s scheduled to move to Toyosu in 2012, so come now and dive in to the market before it becomes a part of history. These shops are open every day except Sunday, national holidays and Tsukiji market holidays (usually two Wednesdays per month). Tsukugon 4-12-5 Tsukiji. Tel: 03-3542-0181. Open 7am-2:30pm. Yamucha Suga Shoten 4-10-2 Tsukiji. Tel: 03-3541-9941. Open 6am-3pm. Marukita 4-9-5 Tsukiji. Tel: 03-3543-5643. Open 5am-1:30pm. Vegetable Ishibashi 4-10-1 Tsukiji. Tel: 03-3545-1538. Open 5am-1pm (approx). Juichiya 5-2-1 Tsukiji. Tel: 03-3541-8118. Open 5-11am. Aritsugu 4-13-6 Tsukiji. Tel: 03-3541-6890. Open 5:30am-3pm. In this article that first appeared in Metropolis magazine I highlight some of my favorite restaurants in Tokyo. Some days, I pinch myself while exploring Tokyo. Am I really spoiled with all of these places to indulge myself? And just when I think it can’t get any better, I happen upon a new area, restaurant, food or trend. The attention to detail when it comes to food here blows me away. Wagyu cows are massaged and fed beer, resulting in marbled meat for shabu shabu. 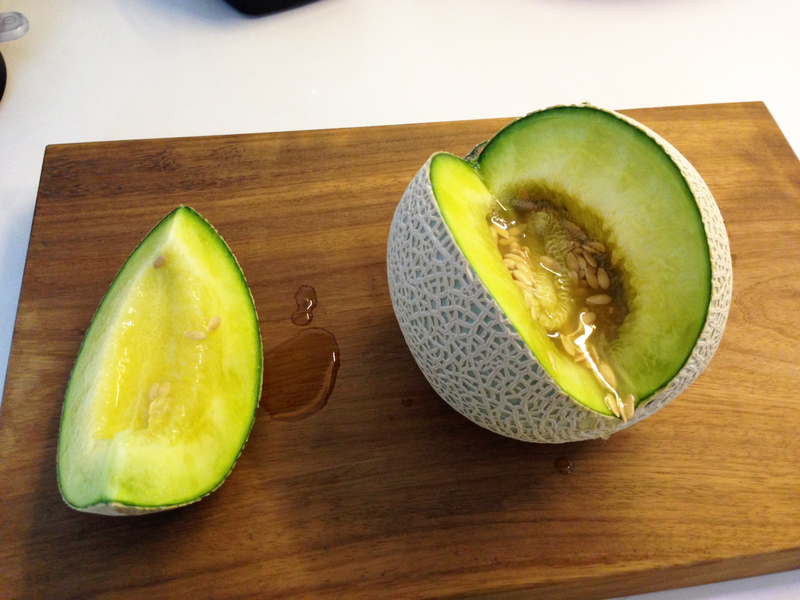 Fruits are manipulated to create perfectly blemish-free specimens. In celebration of all that Tokyo has to offer, here are some shops to get the best of the best in the city. Try wagyu beef sliced paper thin and braised in a sweet soy sauce at Imahan in Takashimaya’s Nihonbashi branch, which has a counter in the meat department where you can have a simple sukiyaki lunch. If you prefer your meat grilled, check out Seikoen Yakiniku in Ginza. Don’t let the disco décor get you down—the shop procures great cuts of Mita wagyu for the barbecue. “Hormones” or innards are considered a hot item at the moment. Nikomi is a dish of innards simmered until tender, and a fine version can be had at Yamariki in Morishita. This izakaya is also known for its grilled pork yakiton and its wine list. Ask for Mizukami-san, the sommelier, to help you pick from his well-thought-out list to go with your food. While wagyu may be the best-known meat outside of Japan, pork and chicken are appreciated on the home turf. When done right, breaded and deep-fried tonkatsu is juicy on the inside and not at all greasy. Katsukura on Takashimaya Times Square’s restaurant floor lets you grind sesame seeds in a mortar and pestle before adding them to the sauce, which then gets poured over the tonkatsu. The bird flu scare in Miyazaki has the new governor, former comedian Sonomanma Higashi, eating chicken on TV to encourage consumers not to give up the faith. If you take up the challenge and want to nibble on bits of chicken stabbed onto skewers and grilled, try yakitori under the tracks at Yurakucho or in the small area of stalls outside Shibuya station (if I told you exactly where, I’d have to kill you). The pot of yakitori sauce at Abe-chan in Azabu-Juban has been in the shop for several decades, evidenced by the thick layer that’s grown on the outside of the pot. How could this be a good thing, you are wondering? Some believe that the container gives the sauce a richness and depth that a new pot would lack. 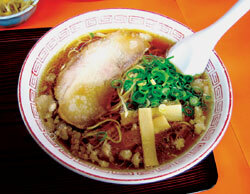 A tour of Tokyo’s food destinations would not be complete without noodles. For ramen, my recommendation is a bowl of hiyashi chukka in a goma dare sesame broth at Sapporo-ya in Nihonbashi. The dish is topped with, among other ingredients, pork, hardboiled egg and tomato, and the savory sauce leaves you wondering if you can lick the bowl clean. For hot noodles, the Jangara chain has a hearty tonkotsu sauce that I top with the spicy mentaiko. Or, for a quick lunch, check out the Hanamaru Udon chain, where you pick your own toppings from a variety of tempura bits and pieces. Tempura is another delight. For high-end, Kondo in Ginza lets you sit at the counter and watch the team behind the counter prep, dip and fry shrimp, fish and vegetables. For a fast-food chain, Tenya serves up a respectable bowl of tempura over rice and drizzled with sauce. This tendon is a bargain at ¥500, and rarely disappoints. I am fascinated by fruit stands like Sembikiya or Takano. 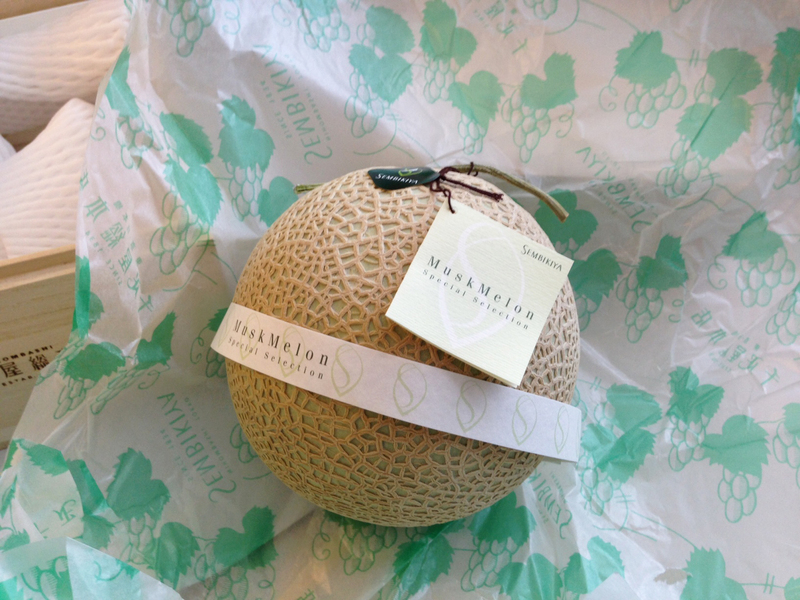 Perfect fruits are wrapped to prevent bruising, and slapped with a sticker price that reflects all of the hard work to get to that stage. To sample a wide variety, order a fruit parfait whose fillings change as the seasons do, or try a single slice of juicy melon. 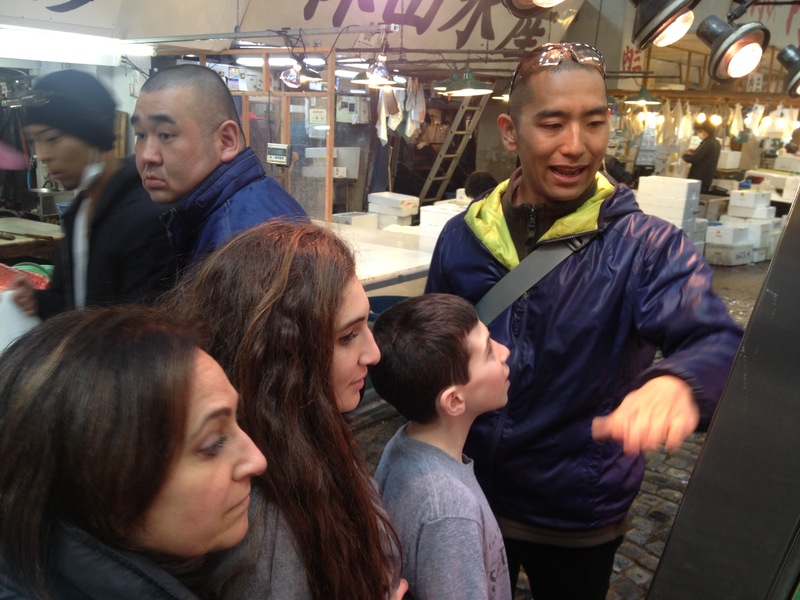 The appreciation for food at its peak, or shun, is reflected everywhere in Tokyo’s markets and restaurants. It doesn’t get much better than what we have available to us, so indulge and enjoy. Imahan. Nihonbashi Takashimaya, 2-4-1 Nihonbashi, Chuo-ku. Tel: 03-3211-4111. Open daily 10am-8pm. Nearest stn: Nihonbashi. Seikoen. 1-6-6 Ginza, Chuo-ku. Tel: 03-3561-5883. Open daily 2-11pm (Sat 10pm). Nearest stn: Ginza-Itchome. Yamariki. 2-18-8 Morishita, Koto-ku. Tel: 03-3633-1638. Open Mon-Sat 5-10pm. Nearest stn: Morishita. Katsukura. 14F Takashimaya Times Square, 5-24-2 Sendagaya. Tel: 03-5361-1878. Open daily 11am-11pm. Nearest stn: Shinjuku. Abe-chan. 2-1-1 Azabu-Juban, Minato-ku. Tel: 03-3451-5825. Open Mon-Sat 11:30am-12:30pm, 3-10pm (Sat 3-10pm only). Nearest stn: Azabu-Juban. Hanamaru Udon. 1-16-6 Jingumae. Tel: 03-3402-0870. Open daily 9:30am-10pm. Nearest stn: Harajuku. Sembikiya (main shop). 2-1-2 Nihonbashi Muromachi, Chuo-ku. Tel: 03-3241-1414. Open Tue-Sun 11am-9pm (Sat until 8pm). Nearest stn: Mitsukoshimae. Takano (main shop). 3-26-11 Shinjuku. Tel: 03-5368-5147. Open daily 10am-8pm. Nearest stn: Shinjuku.